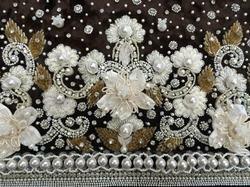 Embroidered Pearl Hand Work offered feature exclusive and enchanting embroidery work finish as demanded by the customers. Offering high quality solutions at competitive prices, the solutions offered are preferred for their unique design as well as fine blend of elegant and soothing color shades. Some of its features include beautiful and mesmerizing embroidery and thread work finish, suits the tastes of fashion conscious customers, provides for that exclusive look needed for making a style statement.